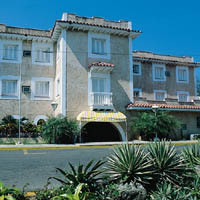 Hotel Dos Mares at bookallcuba.com, hotels in Varadero, Cuba hotels together with car rentals. Hotel Dos Mares , Varadero, Cuba. Calle 53 y 1ra. Avenida, Varadero, Provincia de Matanzas, Cuba. It is located by the beach, 22 kms from "Juan Gualberto Gómez" Varadero International Airport, (24 minutes by car) and one km away from downtown Varadero, (five minutes by car). 34 air-conditioned rooms with private bathroom, satellite TV and phone.A la carte restaurant, two bars, snack bar on the beach, money exchange desk, tourism bureau, parking lot and taxis. STANDARD ROOM Rates in USD /Per Person/ Per Night / Including Breakfast.